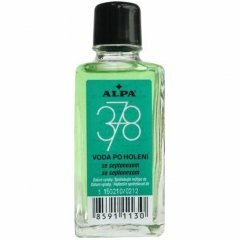 378 (Voda po holení) is a perfume by Alpa for men. The release year is unknown. The scent is fresh-green. It is still in production. Once again, the traditional Czech brand Alpa, of which I have already commented on a few fragrances here, comes up with a surprise. Never judge a book by the cover! The bottle (no cardboard packaging is also dispensed with here) also impresses here with its coarse post-communist industrial charm, which, however, is already passing as "ingeniously retro" today. The batch number and expiry date are hammered back onto the front of the label. So far everything is not unusual at Alpa. In addition, however, the 50 ml bottle does not have the typical shaving lotion shape, but is based on a medication bottle, the fragrance does not even have a real name, but is only referred to as "378" (something else in addition) and that the advertising slogan (written only in Czech and Slovak) on the label does not praise the "male freshness" or the like of the product, but soberly refers to the disinfecting effect of the liquid. With this appearance I tuned myself in to a aftershave for men who reject fragrances and expected a neutral-clean or chemically-disinfectant-like smell. But nothing worse than that! "378" impresses with a deep green, enormously mossy-forested fragrance carpet with a slightly herbaceous and somewhat more woody touch. Despite the wood, nothing here is harsh and certainly not dry, everything remains soft, full, almost luxuriant, to which a certain (but not penetrating) light but striking sweetness may contribute. Overall from my point of view a successful soft-full fougère interpretation (although an identification as a chypre variant would not be absurd), which I really like and costs practically nothing. The consistency of the liquid is slightly viscous and glycerinig, the care effect is well recognizable. After about one hour the scent is only weak and close to the skin, after two hours no longer noticeable, which seems to me quite adequate for a classic aftershave. "I only tested Irish Moss once in a drugstore, I didn't like it at all. I can therefore not necessarily confirm a certain relationship to this classic men's fragrance. However, it is claimed by Bellemorte (here in the statement) and also in the advertising commentary on the website of "Pomadeshop" (the only reference route I know of in Germany) (although it is always stressed that 378 is softer and more elegant), so there may be something to it. The website of the manufacturer does not name a fragrance pyramid, but merely states (linguistically somewhat bumpy) in the German version "Es hat typische Blumen-Zitrusfrucht Duft mit Moos-Unterton". I can't smell flowers or citrus separately, but it may be that citrus notes are responsible for the freshness and floral notes for the soft fullness of the fragrance. The same applies to the musk notes also claimed in some sources: "I would not have thought of them alone, I do not find them implausible. Write the first Review for 378 (Voda po holení)!